This is your opportunity to tell us about the recruitment and skills needs of your business! To help ensure that the council’s skills investment work meets the needs of local businesses we are undertaking a borough wide employer skills survey. This will help us better understand the recruitment and skill needs your business requires to grow and prosper. The survey will only take 10 minutes to complete and involves a range of questions – mostly multiple choice – about your business. The survey can be found at http://bit.ly/suttonbusinesssurvey and will close on 6 February 2015. The information we gather will be held confidentially. Thank you for taking part in the survey! In conjunction with the Cheam late night shopping event on Friday 5th December, Cheam Traders are also holding a raffle to raise money for St Raphael’s Hospice. We’ve been elected to approach all the local businesses to ask if they would be willing to donate a prize for the raffle. This could be a voucher, a bottle of wine or anything!! All raffle prizes will be displayed in Village Travel’s window. Raffle ticket books will be dropped into all businesses to enable everyone to buy and sell tickets. Please can we ask that all raffle prizes be delivered to Village Travel by 26th November so we can display them in our window, for all the Cheam shoppers to see! It will be amazing if we could beat that this year! It is one year since the Cheam Chamber of Trade was reformed. I am very grateful to the dedicated team on the Committee who have helped to move the organisation forward. We have successfully launched our website and newsletter, and have plans to enhance the content. An extremely successful Christmas Event was held with many thousands of happy visitors making their way to Cheam, and enjoying the entertainments put on for them by your Committee. We believe that the Village will have benefitted substantially from this show of goodwill, and we hope to build on the success of this venture, possibly introducing a Mid–Summer Event next year. We also hope to introduce into Cheam a programme called ‘Totally Locally’ which focuses attention on the advantages of buying locally, and the multiplying beneficial effect this has on the local economy. We now have a good means of communicating, as a group, with official bodies including the Council, the Police, Transport for London, local elected Counsellors, schools, colleges, etc. Many thanks must go to Richard Marston and his Committee who arranged the very successful Cheam Charter Week recently. What is needed now is some ‘new blood’ on the Cheam Chamber of Trade Committee, because we have unfortunately had to say goodbye to a couple of stalwarts, and for the Committee to open up to the broader traders group so that we can hear your ideas and try to progress the Chamber. To that end, we will be holding our Annual General Meeting to mark the end of the first full year as a reformed group. All business owners and managers are encouraged to attend, and we hope and expect that representatives from the Council, Police etc will be available for their input. Please come to the AGM which will be held at 6.00pm at the St Dunstan’s Meeting Room (behind St Dunstan’s Church in Church Lane, Cheam) on Tuesday 10th June. Cheam Village Christmas Fair - 2 Days To Go! 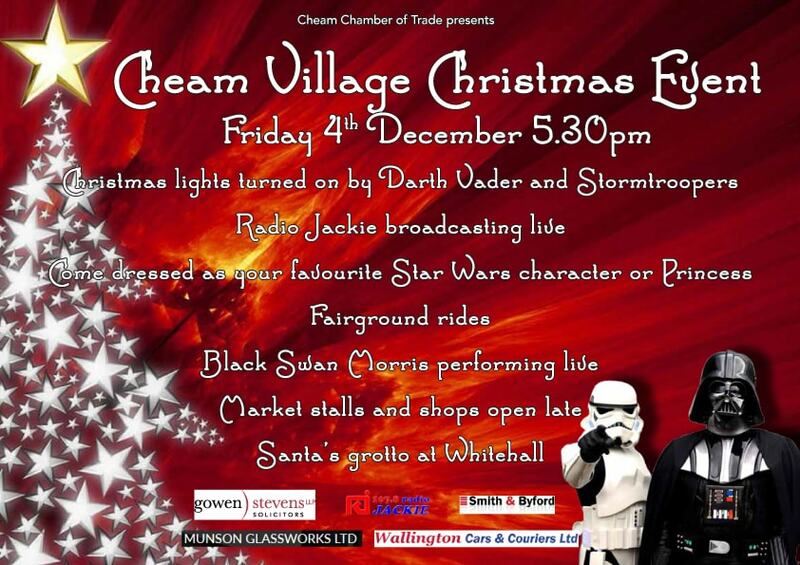 Cheam Chamber of Trade proudly presents the Cheam Village Christmas Fair on Friday 6th December 2013. Please view the schedule of events here.